Disabling the lock screen in Windows 8 can make it quicker to get back to work or play after your PC hibernates. 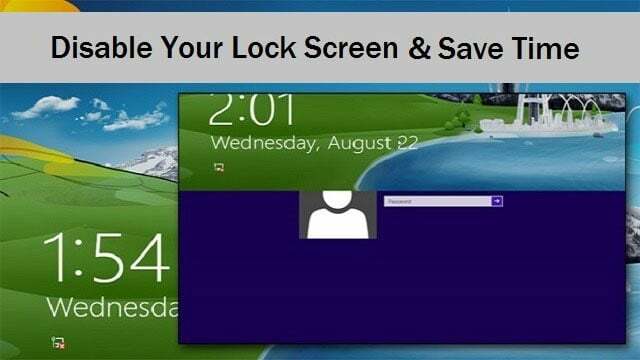 We’ll show you how to disable Windows 8 lock screen in two different ways. The lock screen has always been a blessing and a curse for Windows users. While it offers a level of protection, especially in public, when you’re at home and just step away for a bit, it can take some time to wake your PC. Then, you have to login through the lock screen. Windows 8 makes it easy to disable the lock screen so that when you want to get back to work, you can do just that and not waste time doing it. Rumor has it Microsoft will address this issue in the final release of the Windows 8.1 Pro Preview. Unfortunately, when the preview went live, there was no fix included for this so we can only hold out hope that this issue is resolved in the final release. For now, these two methods will have to do. If you want to disable the lock screen in its entirety in Windows 8, you can do that through your regular PC settings. There’s no hidden way or tweak built into Windows 8 to do this. This is the easier method for disabling the Windows 8 Lock Screen when waking your PC up. Make sure you logged onto the Administrator account for your Windows 8 computer before continuing. If you’re not, this will not work for all users and only for the account logged in. If you log in as an Administrator, you can set this up for everyone, so nobody has to suffer with the issue. Locate the Users settings under PC settings. 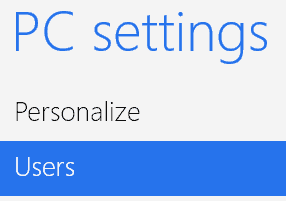 You’ll see under Sign-in options that your PC will already be set up to enter a password in at the lock screen. 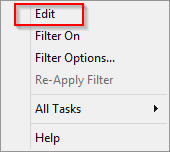 This is the default setting for this option in Windows 8. Click on “Change” to turn it off. A pop-up will warn you what this will do on your computer. Remember: If you’re using a shared computer or utilize your PC in public, this isn’t the most secure option to choose. This means anybody can sit down at your computer, wake it up and instantly have access to your files, folders and programs. 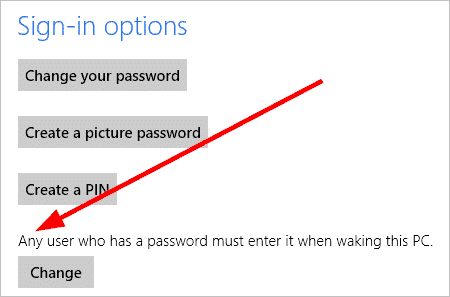 Click “OK” and Windows 8 will change this setting for all accounts using a password on the PC. You can change this back at any time by following the same steps you did to disable the lock screen in the first place. Again, we want to stress that if multiple PC users are utilizing the computer, don’t enable this option. You’re leaving your data and privacy in the hands of anyone who uses your PC. Now, let’s say you want to use the Windows 8 lock screen, but you don’t want to deal with the double window it creates blocking essential information before you login. 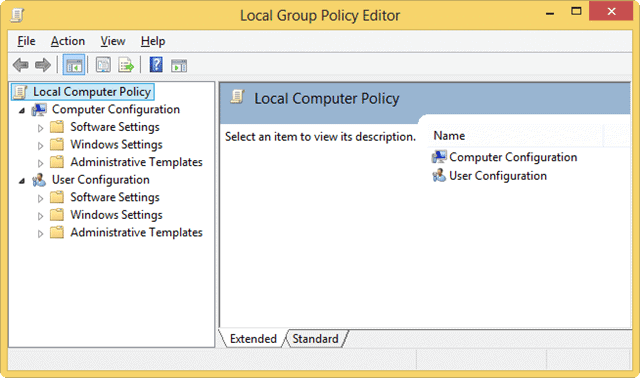 You can do that through the Local Group Policy Editor. This can be beneficial to eliminate the fluff lock screen on top of the login window that’s really not necessary to proper Windows 8 login functionality. 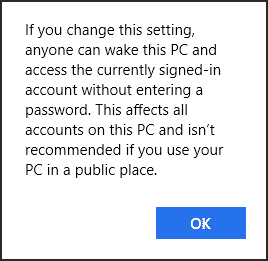 Again, you’ll want to ensure you’re using the Administrator account for your PC before continuing to change the Local Group Policy for the lock screen. 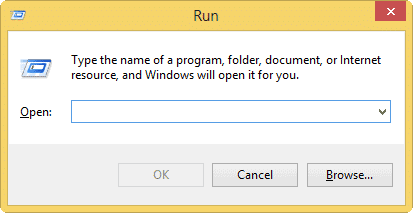 In order to open the Run prompt, click the “Windows Key + R” shortcut. 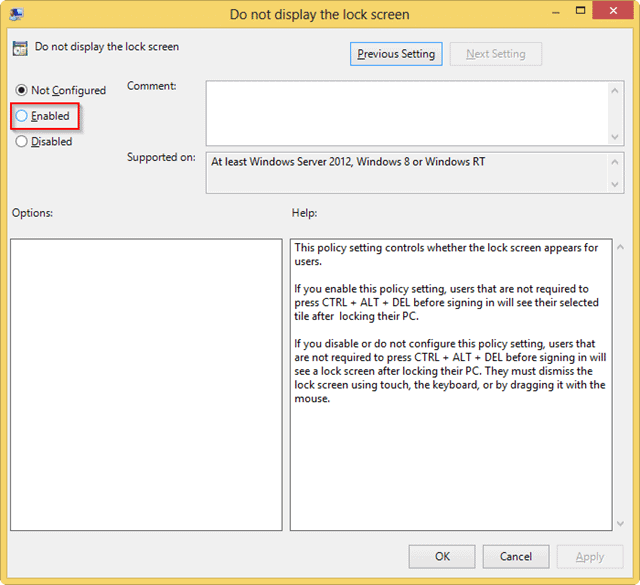 Locate “Do not display the lock screen.” You can read a little more about what this entry does for your Windows 8 PC. This will open more information on the entry, as well as giving you the option to Enable or Disable it. If you click “Enable” this will eliminate the need to click CTRL + ALT + DLT to get past the second lock screen when you wake up your PC. Make sure to click “Enabled,” then “Apply” and “OK” to turn this feature on. When you log back onto Windows 8 after hibernating or sleeping, you’ll only need to enter your password to log back in. Does it Really Save Time by Disabling the Lock Screen in Windows 8? Every few seconds count nowadays in our busy lives. If you don’t share a PC and you don’t use it in public often, disabling the lock screen in its entirety is worth the effort. However, if you use your PC in public, this would allow access to your computer’s contents if you step away and someone decides to snoop around. 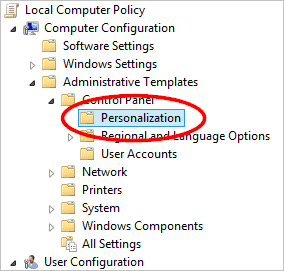 This is where the second option – disabling the lock screen with the Local Group Policy Editor – comes in handy. Since Windows 8, for whatever reason, displays the actual lock screen login in a second “window” within the lock screen after hibernation, disabling that mash up can shave a few moments off your day logging back into your PC. Depending on how and where you use your computer, either disabling option can help save a little bit of your time when using Windows 8.